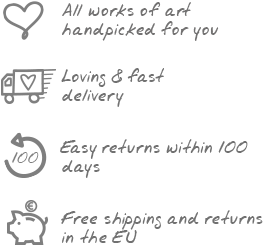 Variety is not limited to motifs in Kunstloft’s paintings, for the sizes of our unique and exclusive canvas paintings are equally varied. When it comes to format, you should pay attention to the surrounding environment of where you would like to hang your artwork. A landscape acrylic painting is particularly effective when placed above the sofa in your living room, since it matches the shape of your sofa. The two objects are thus perfectly complementary. Meanwhile, portrait paintings are marvellous for filling up wall spaces in your hallway, since their height will make the hallway ceiling appear taller. Awakening of nature in spring as depicted on canvas. After all, you should be happy with your decision and only you will know whether you have found the perfect painting in the appropriate size. Perhaps your living room or hotel has no room for a handmade canvas painting, but would greatly benefit from a figurative sculpture. Do browse through our selection of cast stone and metal sculptures and thereby broaden your artistic horizon. It is worthwhile to look beyond what you are familiar with and explore the unknown – you will find things that you did not know you like or need! At KunstLoft you will find artworks of superb quality that respond to the newest trends. Enjoy shopping for paintings in our online shop! Which size a paintings has is not decisive - you must find yourself in the motif in your dining room or hotel. You choose according to your personal taste, whether a small acrylic piece impresses you, that is a subtle eye-catcher, or an XXL painting in oil, which fills extensive walls.